It is now less than a week before I leave for Mount Sidley. In previous blogs I have provided a link to a video about life at Union Glacier (the hub of Antarctic Logistics and Expedition’s operations in Antarctica) and covered the sort of kit I will need for my adventure to Mount Sidley. In this blog I will outline the itinerary for the trip and give a flavour of what (I think) that I can expect. Stage 1 is getting to the southerly tip of Chile, to Punta Arenas a city of around 125,000 people and the largest city in the world south of the 46th parallel south. This involves a flight to Madrid where I pick up a LATAM flight to Santiago. The flight is a monster 14 hour hop to the capital of Chile. I follow it soon after with a 2½ hour flight to Punta Arenas. I arrive on 6th January. Punta Arenas is three hours behind UK time. Here I am met by a representative of ALE and taken to my hotel where, I hope, to meet the other members of my party (other than the ALE guide who will already have flown to Antarctica). Punta Arenas has a cool, dry and windy climate. Summer temperatures average 14C. Summer is also the windiest season. According to Wikipedia, ropes are put up in the city to help pedestrians cope with downdrafts created by the buildings there! a kit check. ALE do not allow you to go to Union Glacier unless they are satisfied you are properly equipped. Arriving early also enables any delayed luggage to catch up with you. a briefing on environmental standards in Antarctica, the flight dispatch process and an update on weather. Environmental issues are taken very seriously. Everything taken into Antarctica or produced there has to come out of Antarctica by the end of the season. There will be limited time to explore Punta Arenas. But I understand there is not much to do in the place anyway – a couple of museums and a penguin colony. Stage 2 is the flight to Union Glacier which is scheduled for 9th January. However, flights do not happen unless the weather forecast shows perfect conditions for the whole of the return trip (the plane returns to Punta Arenas the same day). 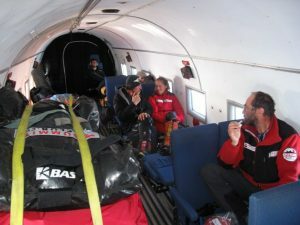 The flight time each way is around 4½ hours and the plane must spend around two hours on the ice unloading and loading. I will pack all the gear I need for the trip in a single duffel. The weight allowance is 25kg. There is a charge of $66USD for each kilogram over the allowance. That said I will be wearing cold weather gear on the plane, including those double boots and the expedition down jacket mentioned in a previous blog. This is for the simple reason that I will need to be prepared for the environment I will step out into. So whilst the flight is scheduled for 9th January, it is known for flights to be delayed for up to a week until weather conditions are right. The duffel is sent to the airport the day before departure. This is to enable ALE to weigh the bags and to pre-load the aircraft so as to be able to depart as soon as the weather is suitable. If the flight is delayed, I might be stuck at the hotel for some days without the duffel and its contents. Surplus items (e.g. travel clothing to/from Chile) are left at the hotel for the return. The route of the flight crosses the Drake Passage, follows the west side of the Antarctic Peninsula and then the spine of the Ellsworth Mountains. The plane lands on a naturally occurring blue-ice runway at Union Glacier. 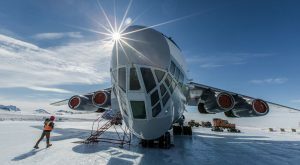 The Ilyushin jet that takes us on to Antarctica was originally designed to carry loads and land in areas where there are no runways – e.g. on the Russian steppe. So seats for around 40 passengers are installed and the plane will be carrying anything from food to vehicles. There are limited windows so a camera is fixed to the nose of the plane and images put up on a screen at the front of the passenger section. So I am not anticipating the most comfortable of rides! I have read that emerging from the plane can be quite a shocking experience, having come from 14oC (58oF) and emerging at perhaps minus 17oC (0oF). That is why we wear our cold weather gear on the plane. 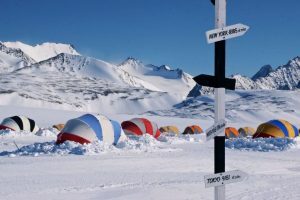 The ice runway is located around 8 kilometres (5 miles) from the camp at Union Glacier. We will be taken in tracked vehicles from the plane to the tents and our bags follow. This is the camp set up by ALE for the three month Antarctic season. It is located at 79o46’S 82o52’W. It is the hub of activities for which ALE provide support. 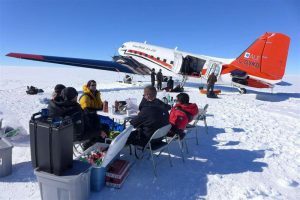 These include visiting the South Pole (whether by ski or air), climbing Vinson Massif (the highest peak on Antarctica), climbing in the Ellsworth Mountains, providing logistical support for scientific teams, providing support for a nearby Chilean scientific base or any other activity that you care to dream up. Recently for example a group wanted to do freefall parachuting over Union Glacier, so this was organised. The camp is capable of accommodating up to 70 adventure seekers in dual occupancy clam tents. Clam tents are double walled sleeping tents measuring 5m x 2.4m and high enough to stand up in. They are provided with a wooden floor which insulates against the snow/ice beneath. There is even a wash basin in each of them. The temperature within the tent will be around 15oC (60oF) because it is naturally heated by the 24 hour daylight. Outside the temperature will range between 0oC (32oF) and minus 17oC (1.4oF). The focus of the camp is the dining tent. Guests are slightly spoiled here because all the food is freshly cooked. Meals are served at set times so there will be an opportunity then to meet like-minded people from all around the world. If the thought of going up to three weeks without a shower is too much to bear, there is limited opportunity to take a shower at the camp though water is rationed as you might expect. So wet wipes will be the order of the day. When I said that everything that goes into or is produced in Antarctica must be removed, I meant everything. This includes human waste. If you do not want to know the detail, please skip to the next paragraph. Urine is kept separate from solid waste – so each cubicle at the camp has two toilets in it to ensure separation. If you are in your clam tent with a storm raging outside, then it is customary to use a pee bottle which can later be emptied, at least for urine. Now, of course, on the mountain things will be slightly different as there will be no pre-installed toilets. Here one urinates into a pee bottle (which is then emptied into a barrel). One poos into your own large bag. That is not as bad as it sounds because (a) it will freeze within a few minutes and (b) the freezing gets rid of smells. Once on the mountain, dehydration will also limit the amount of urine. Bet you are glad to know all of that! I will spend the first couple of days at the camp. 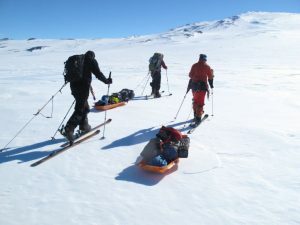 This provides an opportunity to spend some time climbing small peaks nearby to acclimatise to Antarctic conditions and to ensure that all equipment is working as it should. There are also other activities such as skiing, use of fat tyre bikes, walking (!) and the like. two spare batteries for each of the Sony and the GoPro. They will be fully charged in Punta Arenas. The camp also has limited facilities to recharge electrical equipment. Finally there are the expected medical facilities. ALE employ around 30 people for the season to look after guests. One facility that does not exist is access to the internet – though a satellite phone can be available. In addition to the Ilyushin, ALE have three other ski planes stationed at Union Glacier. These are two De Havilland DHC-6 Twin Otters and one Basier BT-67. We will need two of these to get to Mount Sidley. Mount Sidley is about 550 miles from the Camp. So on day 4 (12th January), if the weather conditions permit, we will depart. The travel time is around 5 hours. This apparently long time is because one of the planes carries spare fuel for a dump part way. So we will land part way whilst the fuel is unloaded and the planes refuelled. At that point, one returns to the camp and we continue to the mountain. Upon landing, we have to set up a base camp. The aircraft and its pilots stay with us. Base camp will comprise five sleeping tents plus a mess tent. We will have to build walls from the snow to protect the tents plus suitable toilet facilities. The pilots will cover the plane’s engine to protect it from the elements. Here we will be at around 2,000m (6,700ft) elevation. This compares to Union Glacier’s elevation of around 750m (2,100ft). 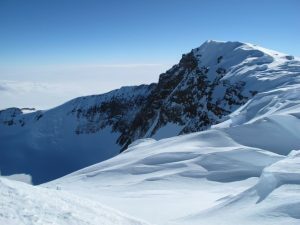 Altitude will start to be a factor at 2,000m because the atmosphere over Antarctica is thinner and therefore the air pressure is likely to be the equivalent of around 3,000m (9,800ft) between the Tropics. Weather here will be harsher than at Union Glacier. Typical temperatures will be minus 15oC (5oF) to minus 40oC (minus 40oF). Temperatures in the tents will never be above freezing. This is the part I know least about – at least in terms of detail. We will have 6 or 7 days to make the climb. From base camp to the summit is around 2,225m (7,300ft). One or possibly two, depending on the route, intermediate camps will be set up. 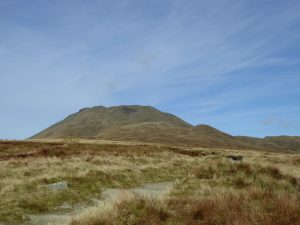 There is the potential to explore new routes on the mountain. The guides will determine the route depending on their assessment of the group’s skill and experience. Something not attempted before is a complete circumnavigation of the mountain’s crater. We will have to carry all our gear (including group equipment) and food with us up to the intermediate camp(s). This will probably weigh in the region of 35k to 45k for each team member. The carry is made slightly easier by hauling most of this on sleds. So we will probably ski up to the first intermediate camp dragging sleds behind us. The gradients are not severe on the lower slopes so hauling the gear in this way is feasible. This will take 6 or 7 hours. Depending on the weather forecast and how people are feeling we will either stay there with a view to making a summit attempt the following day, or descend back down to base camp. If we make an immediate descent, we do not set up tents there but cache them with the remainder of the gear and food. 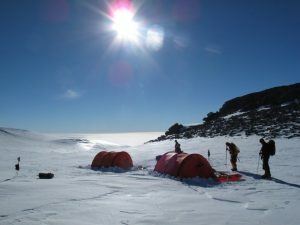 Caching ensures that if a storm blows in the tents are not ripped to shreds and/or blown tens of miles across the Antarctic plateau. Once tents are set up on our first or second trip to the intermediate camp(s), we may protect them again with snow walls depending on the forecast. As for food on the mountain, I am anticipating that we will be living off meals that are reconstituted by pouring boiling water over them. These are not great (though they do provide calorific intake) and do sometimes play havoc with the digestive system. I will also be taking snacks with me and am still pondering what might be the most suitable and palatable snacks to take. Suggestions welcome! So the shortest time to climb the mountain is three days. But of course it is all weather dependent. If we are able to make a quick ascent, then there is the prospect of climbing a nearby (15 miles away) volcano called Mount Waesche. I believe that this volcano has only ever had one previous ascent (where snow mobiles were used). Once our time is up we fly back to Union Glacier stopping off to refuel at the fuel dump and collecting and removing the empty drums. From then on we will be on alert for a return to Chile at any time. Again, of course, this is weather dependent. So I could have anything from one day to a week before I fly out. If on schedule I would be leaving Antarctica on 22nd January. Finally I acknowledge the photos in this blog are made available by ALE from their website. 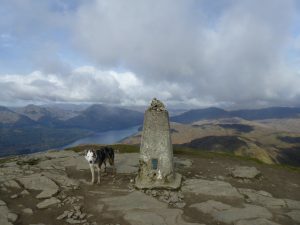 The previous day Jet and I had climbed Sgurr Dhomnhuill in Ardgour. 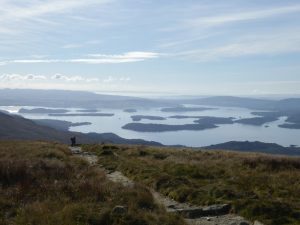 I had originally hoped to climb another P600 hill near Loch Lomond but time and a lack of a place to park had put me off. 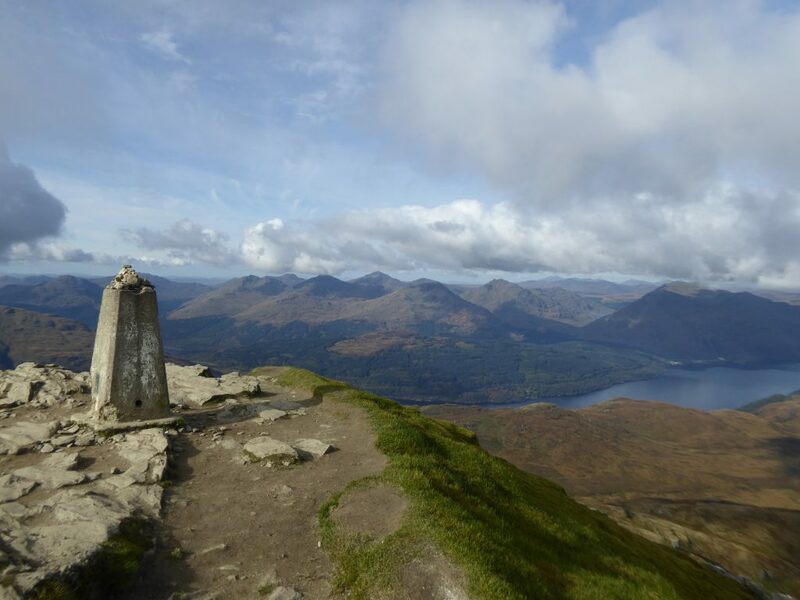 So I returned to a mountain that I had first climbed 30 years before, Ben Lomond. I had forgotten how far off the A82 it was, but eventually we made it to the Forestry Car Park at Rowardennan for a relatively late start at around 9am. Although it was a Monday in October the day was busy, testament to the mountain’s popularity. One day I will do the Ptarmigan Ridge approach. But there is some scrambling near the end and I did not want to have to think about how I might get the dog up this, so I went up the standard route. Whichever way you go there are some nice views over the Loch and its islands. I had a brief rest and snack to admire the view. 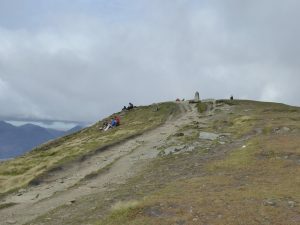 Here is the view towards the summit block. The path is clear all the way. In just under 2½ hours we were at the top. 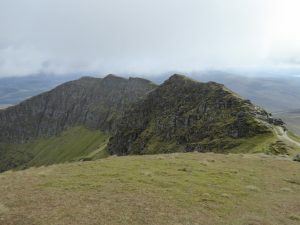 There is a hidden rocky coire on Ben Lomond, the top of which we followed on the way down. 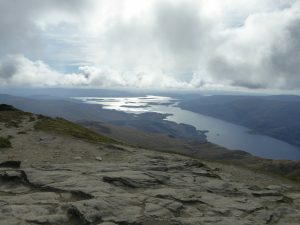 The views to the Arrochar Alps are nice. Plenty of people were having lunch and looking at the views. I took a video from the summit as the clouds began to roll in, as predicted by the forecast. And it took us just under 90 minutes to get back down. A nice straightforward and quick day before our return to Yorkshire.